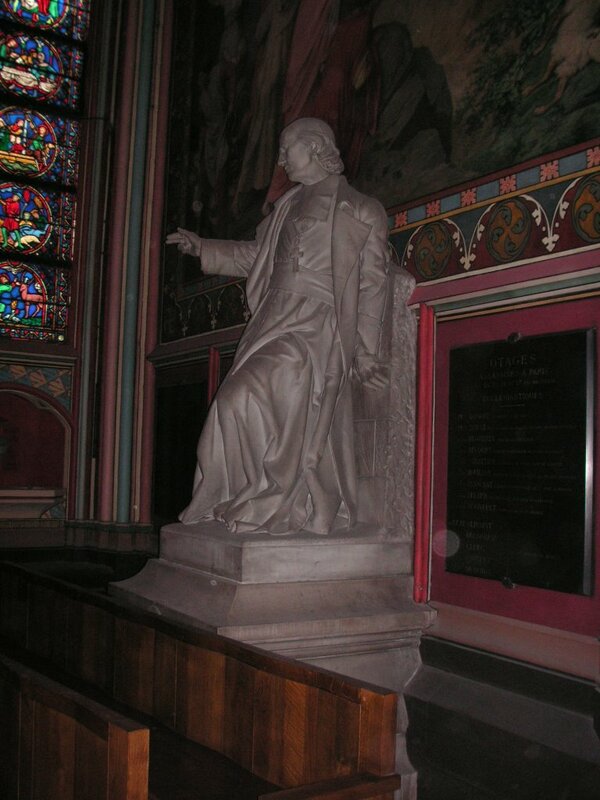 The second nineteenth century Archbishop of Paris to be a victim of revolution was Georges Darboy (1813-71). Ordained in 1836, he became Bishop of Nancy (1859) and Archbishop of Paris (1863). He fiercely defended the rights of French bishops ('Gallicanism') and tried to suppress the jurisdiction of religious orders such as the Jesuits in his diocese, which caused a controversy with Rome. Blessed Pius IX even rebuked him and it is little surprise that he never received the red hat of a cardinal. Present at the First Vatican Council, he did not think the time was right for defining the dogma of Papal Infallibility, though he submitted to the Pope's decision. On his return to France from the Council, war had broken out against Prussia. France was ultimately defeated and Paris besieged. This would be the Archbishop's finest hour and he was zealous in tending for the wounded. Amid the desperation of defeat, a revolutionary Commune was declared in Paris and briefly triumphed. Darboy was taken hostage by the communards and imprisoned first at Mazas and then La Roquette. On 24 May 1871 he was shot by firing squad, along with various other priests, including the Abbé Duguerry, curé of La Madeleine. As the shoots were fired, his hand was raised in blessing. The days of the Commune, however, were numbered and Darboy's body was carefully embalmed and solemnnly buried at Notre Dame. It is fitting that, in 1859, Darboy had written a life of another famous episcopal martyr - St Thomas of Canterbury. Mgr Darboy's jeweled pectoral cross has somehow ended up in the Metropolitan Cathedral, Liverpool. Hopefully it can be put on display when a treasury is eventually built. Incidentally, pontificalia which once belonged to Cardinal Griffin are also kept there. How interesting! I'm also surprised to hear that Griffin's pontificalia has ended up there since he had no links with Liverpool (unlike his two immediate successors at Westminster, Godfrey & Heenan). Mgr Worlock was Griffin's secretary! Has the DVC Bubble Finally Burst?